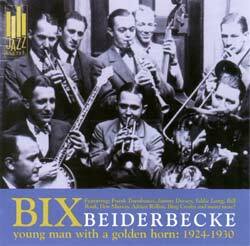 Bix Beiderbecke CDs available from Document Records. Bix Beiderbecke Young Man with a Golden Horn: 1924 ~ 1930. Click here to go straight to the CD. The meteoric rise and turbulent downfall of Bix Beiderbecke epitomised the live fast die young lifestyles of the later iconic music and movie legends and his explosive music career coincided with the beginning and end of the roaring 1920s. Bix Beiderbecke was Born March 10, 1903 in Davenport, Iowa, and by all accounts was a bit of a child prodigy, with the exceptional ability to pick out out songs on the piano when he was just three. He later had piano lessons, but managed to avoid learning to read music very well, preferring instead to "improvise" on the scores he was being taught. 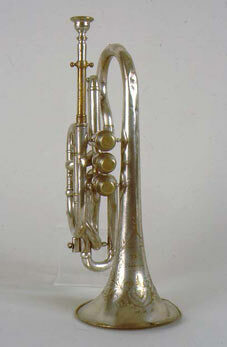 After his older brother introduced him to records of the Original Dixieland Jazz Band in 1918, Bix saved up the money for a cornet and soon taught himself the instrument. In time he cultivated an alluring and intuitive tone, often playing a cooler and softer sound than the one used by most brassmen of the day, but also a sound that displayed an internal warmth. Bix`s growing interest in the coronet, jazz and night clubs, was at odds with his straight laced and conservative parents, to the extent that in 1921 they sent him away from home to be schooled at Lake Forest Military Academy. Unfortunatly for his parents, the school was close to Chicago, which happened to be the centre of jazz at the time. In no time at all Bix was staying up late and sitting in with groups like the New Orleans Rhythm Kings at clubs. After missing too many classes and violating the school’s curfew, due to his nightime excursions into town, he was expelled. Although he was apologetic to his parents, this new found freedom in his life enabled him to concentrate on becoming a full-time musician. 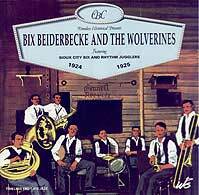 In October 1923, Beiderbecke joined a new group called the Wolverines. They became popular playing in the Midwest and the following year made a series of recordings. Bix’s first record session was on February 1, 1924 when he was one month short of turning 21, and on the track which opens this CD, “Jazz Me Blues”, he recorded his first trademark classic solo. Although the recording quality is primative, Bix’s beautiful tone, use of space, and unusual but ultimately logical choice of notes made it clear that a bright new voice had arrived on the jazz scene. As the year progressed he featured on the Wolverines` recordings and live performances. The next track to feature on this CD is a version of "Riverboat Shuffle" which also has Hoagy Carmichael recording for the first time, who was to become a close friend to Bix. The next song "Big Boy" was cut at what would be the last session Bix would do with the Wolverines. Bix`s coronet playing is the not the only highlight, as he also records a piano solo, one of only four times he would do so in his career. In the fall of 1924 the Wolverines visited New York and made such a strong impression that bandleader Jean Goldkette offered Beiderbecke a job with his large orchestra. Bix accepted, though in retrospect this was a mistake because his sight-reading abilities were very weak. He soon lost the job, although Goldkette told the cornetist that he would rehire him after he learned to read music. On returning to the Midwest in 1925, Bix recorded two songs as a leader, including his “Davenport Blues” with a quintet also featuring trombonist Tommy Dorsey. Between this recording session and the next in 1927, Bix played locally in Davenport, meeting C-melody saxophonist Frank Trumbauer, who he worked with for eight months at the Arcadia Ballroom in St. Louis. During this time Bix learn`t how to read music, which in the fall of 1926 persuaded Goldkette to add him to his orchestra. 1927 was Bix`s year, full of major events and what would become classic recordings. The Jean Goldkette Orchestra won a battle of the bands contest over Fletcher Henderson and Frank Trumbauer was given an opportunity to record some freewheeling jazz with a combo that featured Bix. These sessions produced the cornetist’s most famous solos, “Clarinet Marmalade” is New Orleans-flavored jazz at its best with hot solos from trombonist Bill Rank, pianist Paul Mertz, Tram, Bix, and clarinetist Jimmy Dorsey plus both arranged and jammed ensembles. “Singin The Blues” has classic statements by both Trumbauer and Beiderbecke that have been quoted countless times by later generations of jazz musicians. This is one of those rare recordings in which every note fits. “I’m Comin’ Virginia” features the cornetist’s longest recorded solo and a closing phrase that would be considered his trademark, while on “Way Down Yonder In New Orleans” Bix’s improvisation sounds very much like a continuation of Tram’s ideas. 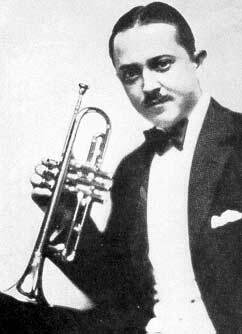 Beiderbecke’s thoughtful approach and beautiful tone made the 24-year old second only to Louis Armstrong among cornetists/trumpeters in 1927. Bix still enjoyed playing piano and he wrote four pieces: “Flashes,” “In The Dark,” “Candlelights” and “In A Mist.” Of these, he only had the opportunity to record “In A Mist,” an unpredictable and episodic track that has its own unique logic. The last recording session of the Jean Goldkette Orchestra recorded the next track, the classic "Clemintine", which became the ensemble`s finest recording. After a short period of playing with a big band led by bass-saxophonist Adrian Rollini, both Bix and Tram joined Paul Whiteman’s huge and commercially successful orchestra. Also around this period, Beiderbecke began leading a series of dixieland-oriented recordings of which “Royal Garden Blues” is one of the best known, highlighted by the leader’s solo. All in all, 1927 had been quite a year. 1928 also had a promising start. Beiderbecke was now a star soloist with America’s most popular dance band and he was holding his own with a group of virtuoso musicians. Unfortunately by this time in his career Bix was also an alcoholic and the punishing schedule of nonstop series of concert appearances, radio shows and record dates, took their toll. However, Bix did manage to record the tracks “San,” “There Ain’t No Sweet Man Worth The Salt Of My Tears” and “From Monday On,” with the young Bing Crosby being a prominent vocalist on the latter two numbers. In addition to the work with Whiteman, Beiderbecke continued recording with Trumbauer’s small groups through 1929 although the arrangements and frameworks became increasingly commercial. “Borneo” has particularly absurd lyrics but a noteworthy tradeoff between Bix and Tram. Of the other Whiteman recordings from 1928, “Louisiana” has one of Crosby’s best early vocals while “You Took Advantage Of Me” has another memorable Bix-Tram tradeoff in which the two complementary players echo each other’s ideas. 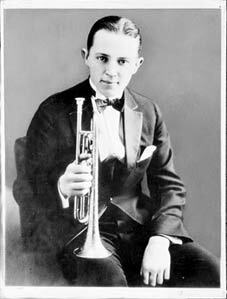 Unfortunately the remainder of Bix Beiderbecke’s life was one of decline. The extremely busy schedule with Whiteman coupled with his excessive drinking led Beiderbecke to a complete breakdown in December 1928. He was out of action for two months, and by the time he returned to Whiteman his spot was partly taken by a young cornetist who was able to sound just like him, Andy Secrest. On “Baby Won’t You Please Come Home” one hears both Bix (who is muted) and Secrest (playing an open cornet) interacting and almost sounding identical. “China Boy” has a similar interplay, with Secrest taking a short break and Beiderbecke having the full-length solo. Despite Beiderbecke’s efforts to quit drinking he was unable to stop, and in September 1929 he was unable to play at all; Whiteman reluctantly sent him home to Davenport to recover. Bix gave up drinking for a time but he was no longer able to play at the same level that he had been just two years before. In 1930 he returned to New York and appeared on three record dates. Beiderbecke makes a heroic effort on “I’ll Be A Friend With Pleasure,” overcoming not only his bad health but an overly sweet opening trumpet statement by Ray Lodwig and an insipid Wesley Vaughan vocal to take one of his last significant solos. On “Georgia On My Mind,” Bix is part of an all-star group and his playing during the song’s conclusion certainly pleased composer Hoagy Carmichael. But this was a final gasp and on August 6, 1931, Beiderbecke died from pneumonia, largely as a result of his drinking and his neglect of his health. He was just 28. More than 70 years later Bix Beiderbecke is still well remembered as one of the brightest jazz voices of the 1920s and a true legend. Thanks to Scott Yanow for the use of his booklet notes.